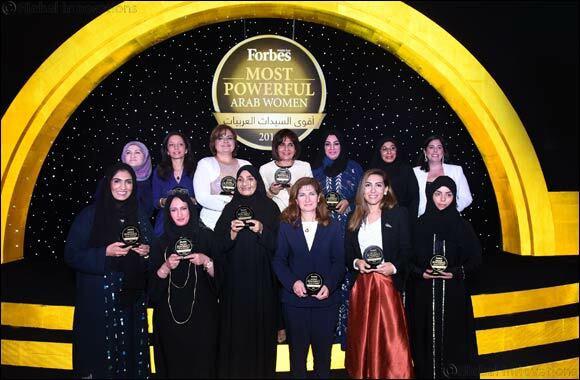 Dubai 19th September 2015: Forbes Middle East has unveiled the names of its Most Powerful Arab Women for 2015 at a glittering awards ceremony that shone a light on some of the region’s most influential and accomplished leaders. The impressive event recognized the achievements of women in reaching the top of their fields in business and government and, in doing so, working towards a fairer and more equal working environment across the Middle East. Some of the awardees present at the awards ceremony included Mona Almoayyed, Managing Director of YK Almoayyed & Sons Bahrain, Marwa El Ayouti, CFO, Vodafone Egypt; Maitha Al Dossari, CEO Emmar Retail UAE; Sana Khater, CFO, Waha Capital Lebanon; Randa Bessiso, Founding Director, Middle East, Manchester Business School, University of Manchester; Shaikha Al Maskari, Chair, Al Maskari Holdings UAE; and Amna BinHendi, Deputy Chair, BinHendi Group UAE. Sheikha Lubna Al Qasimi – Minister of International Cooperation and Development, UAE; Nemat (Minouche) Shafik – Deputy Governor, Bank of England from Egypt; Lubna S. Olayan CEO Olayan Financing, Saudi Arabia; and Raja Easa Al Gurg, Managing Director Easa Saleh Al Gurg Group, UAE also feature on the Forbes list - “The World's 100 Most Powerful Women”. Egypt was closely followed by Lebanon and the UAE, both with 14% of the overall entries. These included Maitha Al Dossari, CEO of Emaar Retail, whose portfolio includes the Dubai Aquarium & Underwater Zoo, Dubai Ice Rink, KidZania®, SEGA Republic, and Reel Cinemas. Also Kawthar Makahlah, CEO of BCI Group, a leading supplier of wholesale beauty products with eight subsidiaries across the GCC and 260 employees. 60% of the most powerful business women hold executive management positions, with another 24% having worked their way up to the top of their family business. For example Mona Almoayyed, Managing Director of YK Almoayyed & Sons and former head of the Bahrain Business Women’s Society, leads more than 2,000 people and represents over 300 brands. Out of the outstanding top 100 line-up over half are working in the banking, investment and finance, and diversified sectors and there are 16 founders, including Maha Al-Ghunaim of Kuwait, who co-founded Global Investment House in 1998, which went on to become the first Kuwaiti firm to list on the London Stock Exchange.